I cannot tell if the Quoin is not what it used to be, or if my tastes have moved on, but my most recent experience of their bar was a bit of a let-down. Their active menu does not match the one they have posted, so I have included a snapshot of it here. I have not tried all of these drinks, but one can imagine and extrapolate. I’m not trying to sling hate, but it is not a very engaging menu. The Mayfair 75 is an interesting variation on the French 75, which is not a drink that gets me going, but Earl Grey syrup and prosecco has potential. None of the other drinks really stand out to me. 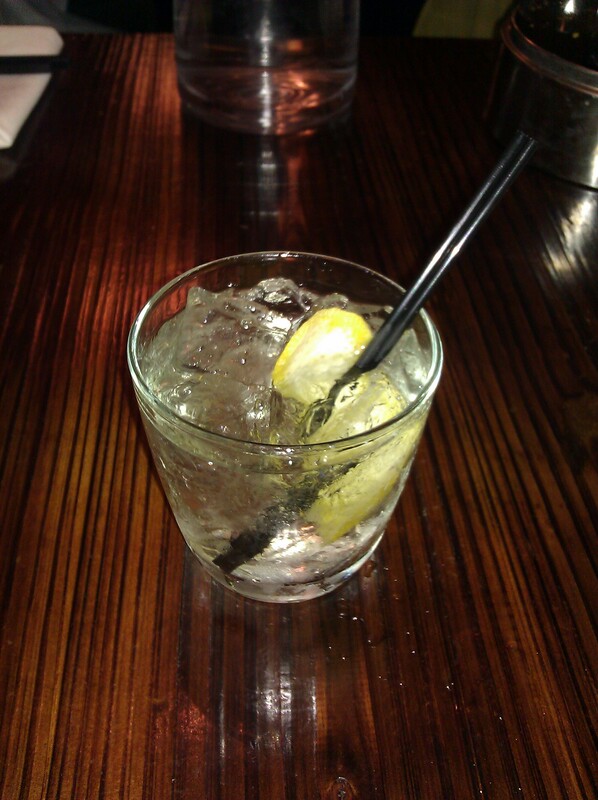 Rachel’s ginger beer has no place in a mixed drink; it’s the equivalent of using bottled lemon juice. “Fire in the belly” is a margarita with an infusion of hot peppers. Domaine de Canton is a mediocre ginger liqueur lacking in intensity of ginger flavor. The brown derby is a respectable old horse, I suppose, though I have personally never found the concept of grapefruit juice and bourbon compelling. Grapefruit juice is bland and watery, even fresh, even undiluted, and honey, bourbon, and grapefruit all occupy the same mid-low earth flavor profile, so that the end result is muddy and takes away from the bourbon. Even the sojus, which used to be so excellent, were not up to snuff this time. I ordered lemon tarragon soju, and the tarragon was scarcely detectible. Lemon soju is pleasant enough on its own, so it was by no means a bad drink, but it fell short of what it could be. I was accompanied by my friend Joanna, who ordered the Lazy Gardener. 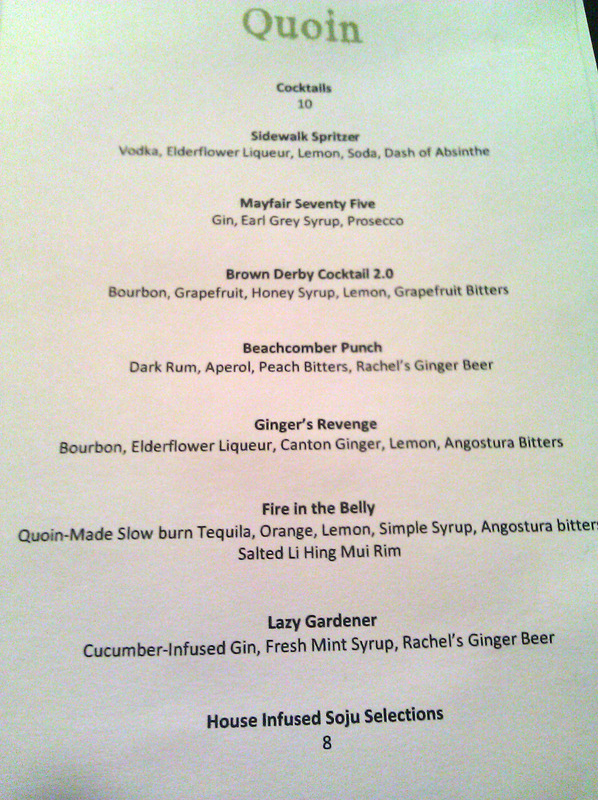 Fresh mint syrup and cucumber gin has potential, but the drink was over-diluted and the Rachel’s was just disappointing. If you’re looking for a good drink in Fremont, you’d be much better off at the Backdoor. Despite all that, the noodle and rice bowls are tasty, if a bit over-wrought. 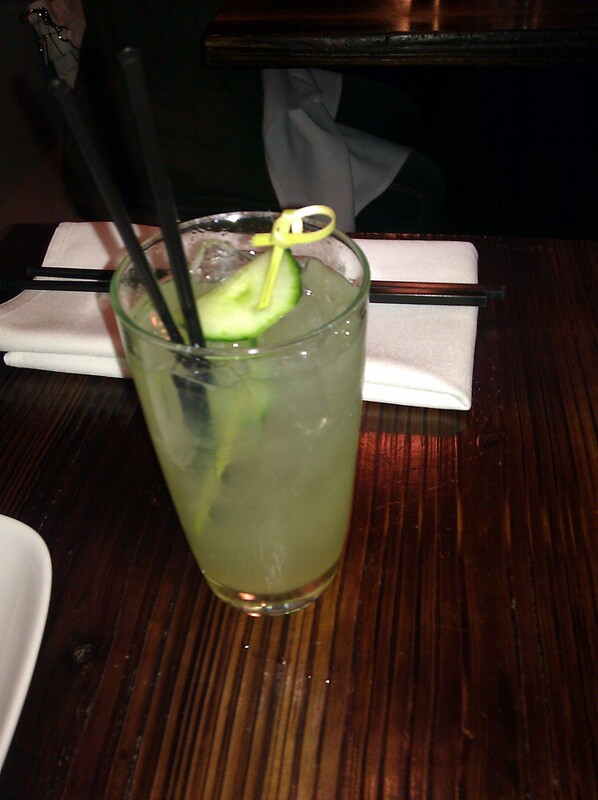 Categories: excursions | Tags: fremont, infusion, soju | Permalink.